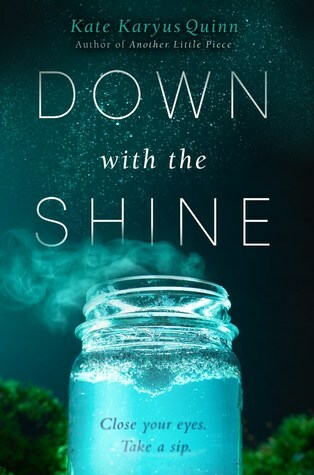 Down with the Shine is an extremely engaging book with a dark sense of humor and fantastic characters. I had read Another Little Piece by Quinn, and I wasn't sure what to expect in this novel. I wasn't really ready for another horrifying book, but this novel has a completely different feel to it. Yes, some of the events are terrifying, but there were a lot of socially awkward, comedic moments. Lennie is completely different from Annaliese, and just like with Another Little Piece, even though the events seemed so unbelievable that I should have scoffed at them, I was able to easily achieve a willing suspension of disbelief. I really enjoyed this book. Lennie was incredibly complex and oddly easy to relate to. Her situation also brings up a lot of nature vs. nurture questions, but her voice kept me engaged. She was so matter-of-fact about everything that I couldn't not believe her. She wasn't prone to hyperbole or drama, and I found myself believing every word she said. Smith was also an engaging character whom I loved. He was complicated and dark, but also good deep down. The side characters, like the uncles, Dylan, Larry, Lennie's mom, Rabbit, Leonard, etc. were all real and tangible. There wasn't a single cookie-cutter, 2 dimensional character in this book, and I adored that. The plot itself, which I'm learning is typical of Quinn's books, is very complex, extremely unbelievable, and completing engrossing. Somehow I managed to believe the events unfolded just as Lennie said they did, and I fell under this book's spell after the first couple of pages. I couldn't put it down, and I read the entire thing in a day - even though I had to take breaks to clean and pack for BEA. The novel is fast-paced, and Quinn's descriptions are beautifully done. I could fully picture and understand everything she talked about, even if a lot of the occurrences were so bizarre that they shouldn't have made any sense. The plot twist was something that I didn't see coming, and the ending was beautifully done. I know this was a standalone novel, but I can't wait to read what Quinn comes up with next. Overall, I'd recommend this book to people who love contemporary YA with a touch of mystery and people who love paranormal YA. This novel manages to combine the two gracefully and leaves the reader wanting more. Well done, Ms. Quinn. Great review! I've been hearing great reviews about this book, and it totally looks and sounds like an fantastic and amazing book. Also I've been dying too read a book by Kate Karyus Quinn for a long time now. I might check this one out first too see if I like it or not. Thank you for your awesome post.